This kit features the Stellar 500 watt lamps that are color balanced to 3200k enabling them to be used with many other Interfit products such as SXT3200 or halogen lighting. A softbox makes this kit stand out, offering a great diffuse light quality for spectacular portraits. The included umbrella also makes a great modifier for a fill or hair light. The stellar tungsten units feature -InchS-Inch type bayonet fittings enabling the use of stellar light shaping accessories such as beauty dishes for creative portraits and fashion images. Rounding out this kit is a carry bag to help protect your equipment. 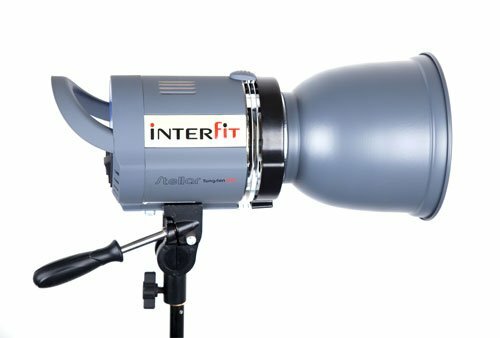 This Interfit INT187 Stellar X Tungsten Umbrella and Softbox Kit includes 2x Stellar Tungsten (INT184), 2 X 500w lamps, 2 xCOR750 Light Stands, 1x 24-Inchx24-Inch softbox.1x Transl. Umbrella and Bag. This Stellar 500 watt lamp is color balanced to 3200k enabling it to be used with many other Interfit products such as SXT3200 or halogen lighting. 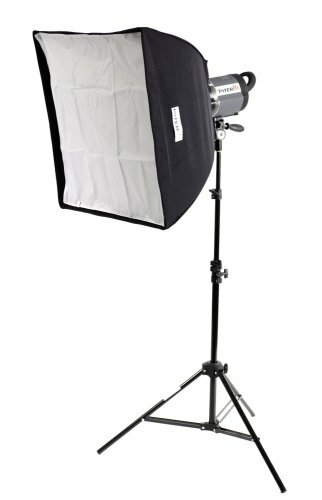 This stellar tungsten units feature a -InchS-Inch type bayonet fitting enabling the use of stellar light shaping accessories such as softboxes of a beauty dish for creative portraits and fashion images. 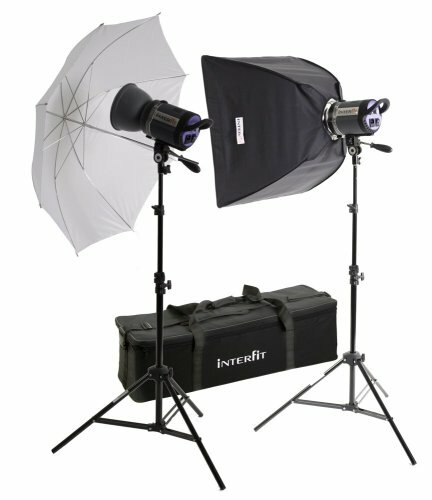 This Interfit INT184 kit consists of a Stellar X Tungsten 500w head and Softbox, 500w lamp, 1xCOR750 Light Stand and 1x 24-Inchx24-Inch Softbox. Help increase your internet sales using Smith-Victor's new line of Light Box Shooting Tents. 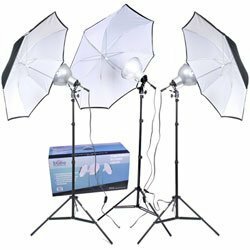 Produce professional quality images with these inexpensive and simple-to-use light boxesdesigned to diffuse light and eliminate unwanted reflections and shadows. The Light Box Shooting Tent can be lit from either side, top, front, back and with a Smith-Victor CM24 Clear Tabletop Shooting table, from underneath Using any type of lightsource - photoflood, quartz halogen, strobe, flourescent, HMI or ambient daylight, and made of durable diffusion material, they are ideal for product shots including jewlery, glassware and just about any type of product. Front panel is removable for ease of produt positioning. The Light Box Shooting Tent comes with one each removable white andblack cloth sweep that provides complete separation from the subject. The Light Box Shooting Tents fold flat and fit into a slim nylon carrying case for on-location shooting. Photoflood Light Box Tent Kits Light Box Shooting Tents kits using tungsten photoflood lights. These lights are very economically priced and offer more light output than floursecent lamps. The 12" aluminum reflectors have an etched interior to increase light output and have a photographic black baked-on enamel finish. 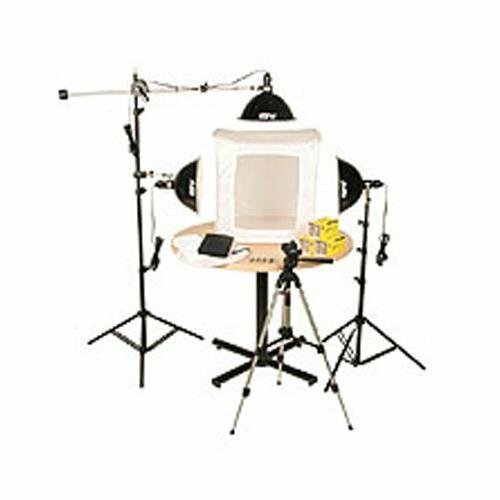 This kit is designed for quality digital studio photography both in the light that it produces and in the workmanship of the materials. The light heads feature ceramic sockets for long life, bayonating reflectors for secure fit and a shape that is designed to produce even light with no hot spots or concentric circles.The CSA line cord has a heavy duty on/off switch to ensure years of reliable use. The white umbrellas have a black backing to maximize the light. The 8" reflectors are sized to allow the maximum amount of light to reflect back to the subject. Additionally, the socket of the reflector can be adjusted allowing the light to be "focused" changing the edge of the light from soft to hard. Also, this adjustment allows the umbrella to be filled without unnecessary spillover resulting in lost of light. 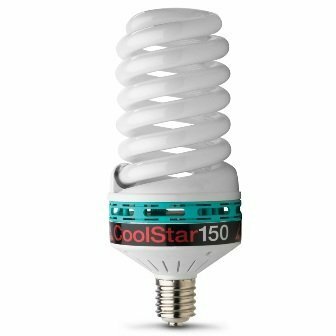 The Starlite CoolStar 150 is the brightest CFL (Compact Fluorescent Lamp) available for photographic lighting. Color balanced to 5600°K, allowing daylight balanced shooting. Cool light operation allows for continuous lighting while using economical strobe-designed soft boxes. Key Features: Daylight balanced (5600K) Bright light output - Brightness equivalent to 450-500w tungsten light. 8000 Lumens. Fits the Starlite QL and Starlite 3200 light heads. Looking for more 500w Tungsten Light Head similar ideas? Try to explore these searches: Gift Box Card Holders, Baby Collectible, and Mock Turtleneck Compression Shirt. Look at latest related video about 500w Tungsten Light Head. Shopwizion.com is the smartest way for online shopping: compare prices of leading online shops for best deals around the web. Don't miss TOP 500w Tungsten Light Head deals, updated daily.